Going to the Dogs: What’s trending these days? Dogs! Man’s best friend will be welcomed at Chase Field this summer as the Arizona Diamondbacks join with Phoenix-based PetSmart to create the nation’s first season-long dog-friendly ballpark. 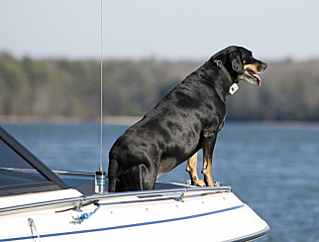 Meanwhile Boatsetter, the Airbnb meets Uber of the boating industry, is urging boaters to bring their four-legged friends on their next boating trip. Perhaps the most surprising entry, though, is an Internet of Things concept dubbed Connected Dog, developed as part of a campaign by Volkswagen. Designed to make the owner’s life easier, it uses an app connected to a doggie cap that contains a camera, GPS device and speakers through which the owner can deliver commands. For competitive consumers in Stockholm, it was a challenge they just couldn’t pass up. In a technology-fueled marketing move, Adidas brand Reebok put up an outdoor ad equipped with a built-in speed camera and tracking technology. 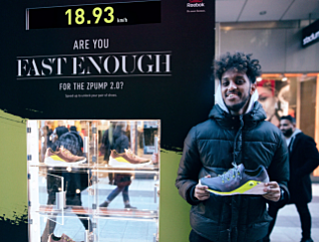 The ad beckoned contenders to try to race past the outdoor kiosk at a pace faster than 17 kilometers per hour (roughly 10 mph) in an attempt to win a brand new pair of ZPump 2.0 shoes. If they hit or beat the target, a green light glowed. Athletes and weekend warriors got in on the action, with many able to speed up just enough to unlock a new pair of sneakers. 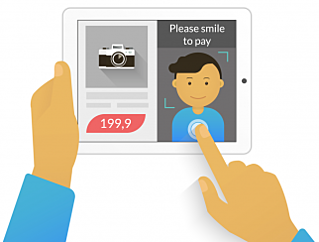 Faceoff against Fraud: How would you feel about paying with your face? Using a new system called MasterCard Identity Check, the credit card provider will be able to use biometrics like face recognition and fingerprint scans to better secure online shopping. Colloquially referred to as “selfie pay,” the new system uses an image of a shoppers’ face or fingerprint — in lieu of a password — to help fend off fraudsters. The process is similar to the routine of filling out credit card information prior to making an online purchase, but selfie pay adds a step. To read more details on these and several other trends for April 2016, read complete article here.